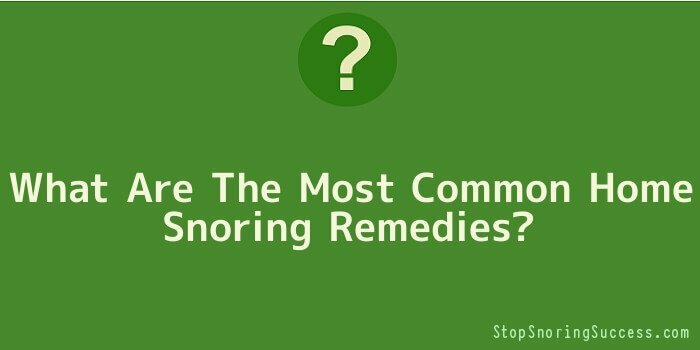 What Are The Most Common Home Snoring Remedies? Nobody likes to sleep next to loud snorers. Snoring can cause sleepless nights not only to the snorer, but also to people sleeping in the same room or house. But sleep deprivation is not the only problem. While most cases of snoring are harmless, snoring has many detrimental effects to one’s life: irritability, sluggishness, strained relationship, and even decreased sexual appetite. Good thing, there are a number of ways you can do at home to control snoring and get a more comfortable sleep. Home remedies for snoring are natural, simple, safe, and inexpensive methods to address the root causes of snoring. Most natural home remedies work by clearing up your nasal passage. Try these common home remedies now to prevent snoring from wreaking havoc on your life and your relationship with your partner. A change in your sleeping position can lead to a restful sleep. When you sleep on your back, your tongue tends to fall back. This blocks the air passage and causes snoring. That being said, you must avoid sleeping on your back. Instead, you can sleep on your side or on your stomach to reduce snoring. Make sure that your head is slightly elevated as you sleep by using a firm pillow. Or better yet, use an anti-snoring pillow that keeps your head aligned correctly with your spine. Obstruction in the air passage, which leads to snoring, is a result of stuffed nose, a tensed throat, or a jaw that’s wrongly positioned. These breathing problems can be remedied through breathing exercises. Taking deep breaths can relax your throat and normalize your breathing so that you won’t snore again. Heavy smokers and drinkers are more likely to snore than those who neither drink nor smoke. The health problems caused by drinking alcohol and smoking cigarettes trigger snoring. So quit those unhealthy habits, and you will be able to sleep soundly at night. About 40 percent of overweight people snore. Obese people are most likely to snore often because their air passage is blocked by fat forming in it. The fat deposits in the stomach also hamper the proper functioning of the diaphragm, which is an essential respiratory organ. All these lead to incessant snoring. Keeping a balanced diet and working out regularly can greatly help reduce weight and control snoring. Some cases of snoring are caused by stuffy nose due to colds or flu. Nasal congestion blocks the air from passing through your nose, causing the snorer to breathe through the mouth. To relieve yourself from snoring, it helps to take medications such as decongestants that clear up your nasal passage. Saltwater nasal drops can also provide relief for nasal congestion by flushing out mucus that obstructs the nasal pathways. While these nasal drops are available in drug stores, you can make your own by mixing ¼ teaspoon of salt in 8 ounces of distilled water.